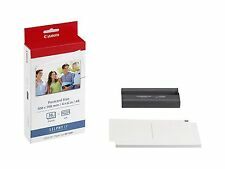 This genuine Canon Ink/Paper Pack for SELPHY CS series printers gives you everything you need in order to create great photo prints. The combined dye-sublimination and paper system gives stunning photos with a bright sheen that adds a professional touch to your results. The all-in-one design makes installation easy, providing you with up to 108 postcard-sized photos. Canon Selphy CP100 Canon Selphy CP1000 Canon Selphy CP1200 Canon Selphy CP200 Canon Selphy CP220. Canon Selphy CP300 Canon Selphy CP330 Canon Selphy CP400 Canon Selphy CP500 Canon Selphy CP510. Canon Selphy CP520 Canon Selphy CP530 Canon Selphy CP600 Canon Selphy CP710 Canon Selphy CP720. With a pack that includes a colour ink cartridge (containing cyan, magenta and yellow) as well as 36 sheets of glossy photo paper, the KP-36IP pack is the perfect product for creating high quality postcards with your SELPHY CP series printer. Printing with photographic precision, you can rely on genuine Canon technology for superb output. Definition is sharp and shades are clearly defined from each other, preventing any type of blurring. With a pack that includes a colour ink cartridge (containing cyan, magenta and yellow) as well as 36 sheets of glossy photo paper, the KC-36IP pack is the perfect product for creating high quality prints with your SELPHY CP series printer. Printing with photographic precision, you can rely on genuine Canon technology for superb output. Definition is sharp and shades are clearly defined from each other, preventing any type of blurring. Marke Canon. Paper surface Shiny. paper format 10.0 x 14.8 cm. Product Photo Paper. Security designation Special paper. Paper weight no manufacturer g/qm. Paper coating unilaterally. Duplex printing /-Copy No. All goods are new unless stated otherwise. Model: KP-36IP. Add to Favorites. Add To Favorites. SELPHY CP820. SELPHY CP910. SELPHY CP1200. SELPHY CP1000. SELPHY CP1300. CANON KIT RP-108. COMPATIBILITY WITH CANON PRINTERS. SELPHY CP810. -- SELPHY CP900 White Wireless. -- SELPHY CP900 Black Wireless. -- SELPHY CP800 Black. -- SELPHY CP800 White. -- SELPHY CP790. -- SELPHY CP760. -- SELPHY CP770. We do not provide English Manual, You can find it easily at website. bran new item, in original box. 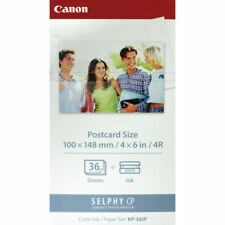 Canon Selphy printer kit consisting of 36 sheets 10 x 15. SELPHY CP100. SELPHY < span class = "notranslate" > CP200. SELPHY < span class = "notranslate" > CP220. SELPHY < span class = "notranslate" > CP300. For SELPHY CP series printer. KP-108IN (108 sheets) Paper / Ink Cassette Set. We do not provide English Manual. electronic product provides 220v 60mhz with 2round pins plug for C type. For SELPHY CP series printer. KC-36IP (72 sheets) Paper / Ink Cassette Set X 2. Model Canon PCPL-CP400. We will provide best service! Masa Japan. MPN PCPL-CP400. Ending Soon. Making use of dye-sublimation technology, the CP100 frees you from concern about smudged inks or unwanted spotting. With 36 sheets of photo paper. Ink and paper are compatible with previous models (selphy CP series only). 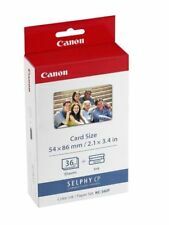 Canon Selphy KC-18IS Sticker Paper and Ink Kit. For SELPHY CP series printer. KC-36IP (108 sheets) Paper / Ink Cassette Set X 3. For SELPHY CP series printer. Take your favorite photo's everywhere! 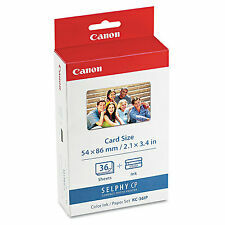 The KC-36IP set requires a compatible PCC-CP400 Card Size Paper Cassette to print. Compatible : CP820 / CP910 / CP1200 / CP1300. 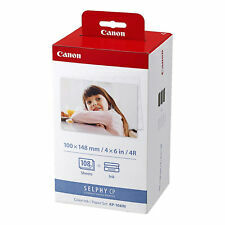 SELPHY Photo Printer Paper Set. 108 Sheets ink. 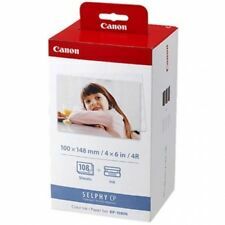 FOR SALE IS A NEW OPEN BOX(ALL IS SEALED) GENUINE CANON SELPHY CP COLOR INK / PAPER SET KP-108IN FOR COMPACT PHOTO PRINTER. For use by SELPHY CP1300, CP1200, CP910, CP900, CP760, CP770, CP780 CP800 Compact Photo Printers. Verify that your printer use this paper and ink before ordering. PRE-CUT 4x6 Paper. Ready to print. 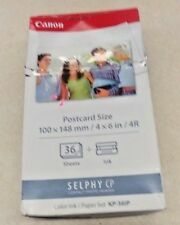 CANON SELPHY CP COMPACT PHOTO PRINTER COLOR INK/PAPER SET KP-361P. Condition is New. Shipped with USPS First Class mail. I ship within one business day of payment excluding weekends and holidays. FREE SHIPPING IN THE CONTINENTAL US. EBAY GLOBAL SHIPPING FOR INTERNATIONAL. 108 Sheets 4" x 6". 3 Color Inks. Einfache Handhabung und vertretbare Kosten machen Canon SELPHY Drucker und Verbrauchsmaterialien zu den beliebtesten am Markt. Entwickelt für: Selphy CP-100/200/220/300/. Digitale Fotografie. und KD-NR. New and unused. We are always happy to work with you to help resolve any issues that may arise or slip our notice! Our Product Testing Policy We source our products from many different places, but we take all our sales seriously and try to provide only quality, working products. New in original manufacture packaging never opened. 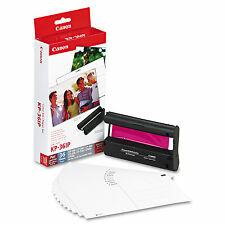 New Canon Color Ink/Paper set KP – 108IN Will ship day I live or no later than today after purchase. Model: Canon Selphy Sheet KP-108IN. 4x6 (148 x 100mm). Authenticity Promise. Color Ink Paper Set. Nation Standard Intl. Item Number. But Needs Following Conditions. Fiji, Kiribati, Solomon Islands, Samoa. SELPHY CP400 / CP500 / CP510 / CP600 / CP710 / CP720 / CP730. SELPHY CP740 / CP750 / CP760 / CP770 / CP780 / CP790 / CP800. SELPHY CP900 / CP 910 / CP 1200. SELPHY CP400 / CP500 / CP510 / CP600 / CP710 / CP720 / CP730. SELPHY CP740 / CP750 / CP760 / CP770 / CP780 / CP790 / CP800. SELPHY CP900 / CP 910 / CP 1200. Photo Printer CP-100 / CP-200 / CP- 220 / CP-300. Inkjet/deskjet machines: CP-100, CP-200, CP-220, CP-300, CP-330, Selphy™ CP400, CP510, CP600, CP710. 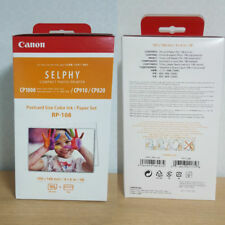 SELPHY CP100 Compact. SELPHY CP200 Compact. SELPHY CP220 Compact. SELPHY CP300 Compact. SELPHY CP330 Compact. Quentity : 108 Sheets. Sheet Size : 4 x 6 in. Australia, South East Asia. 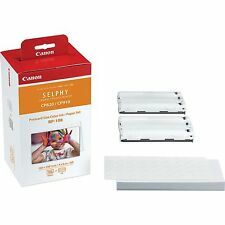 Canon RP-108 4x6 Paper/Ink, 108 Sheets for SELPHY CP820, CP910, CP1200 , CP1300. Condition is New. Shipped with USPS Priority Mail. SELPHY CP Series. Official CANON color ink / paper set L size. Manufacturer: CANON. Contents: ink sheet special paper (L-size) 108 sheets of the ink sheet and the special paper. Paper size: 89 × 119mm.